I had an amazing, beautiful Mother’s Day. I ran with a dear friend. My daughter made me a sweet card and gave me some yarn so I can make her a hat for when she goes to sleep away camp. She picked out not-itchy yarn to guarantee she will wear it. I spent a few blissful hours alone before my mom and I had our traditional buy flowers until the car is full then buy some more shopping trip. 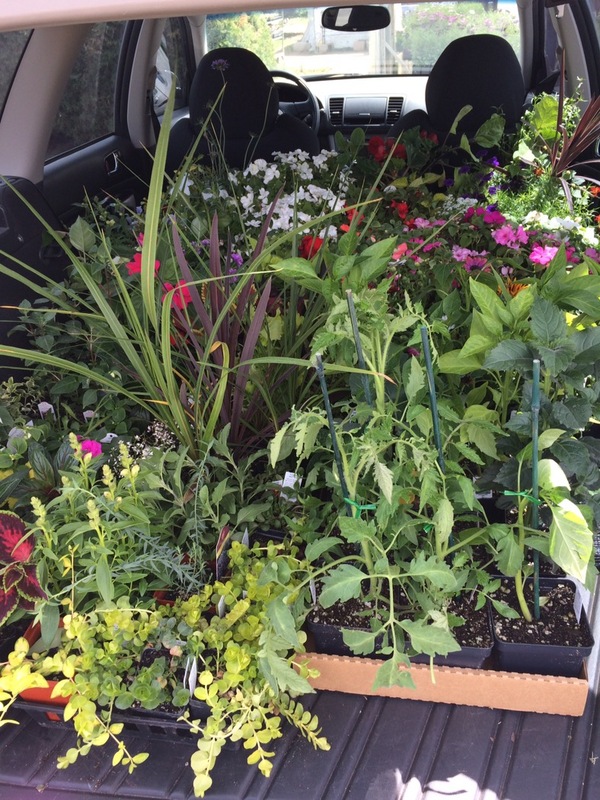 This is a picture of her car before our last stop where we bought three more flats of plants. (She had one on her lap and one under her feet by the end.) We decided our million dollar idea is to build a double-deck car plant stand. My head explodes. My husband and I have this fight at least once a year. We’ve had it on Mother’s Day, my birthday, Valentine’s Day and our anniversary. He has a variety of lame excuses such as he didn’t know he was supposed to buy me a card or he forgot or whatever, but at least once a year he totally ruins a holiday for me. I know it’s going to happen, so I’m mad at myself for letting it bother me, but I feel like I’ve given up so much. I don’t expect a present. I don’t expect flowers (because I have plenty, thanks.) I don’t want chocolate. I don’t expect breakfast in bed. I expect a card which is available at any grocery store, card store, book store, and even most convenience stores. When you can’t even bother to get me a card it’s like a giant middle finger raised with a “you don’t matter at all” tacked on top. My husband knows this. I am not a shrinking violet when he forgets the card. We have been together for twenty years, but this year I gave up. He is never going to remember the damn card. I went to bed furious at myself for letting him ruin my great day and at him for forgetting the card, again. I made plans to run off with the cute lifeguard at the pool, or the cute bagel store guy, but when I woke up I tossed those ideas and solved the problem: I went to Target and bought my own cards. There was one decent Mother’s Day card left, so I got that. 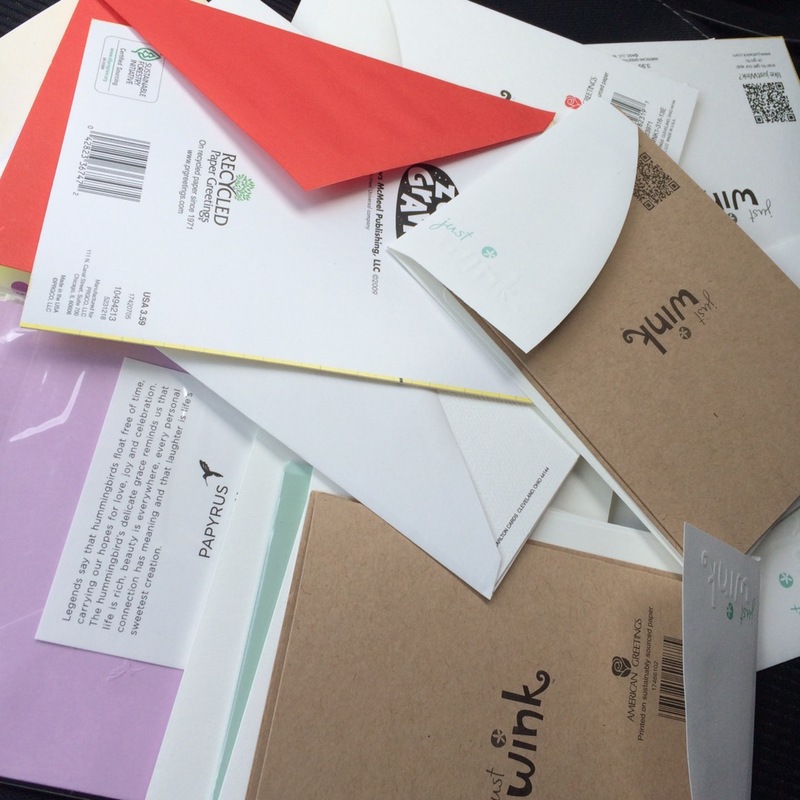 I picked up 4 birthday cards, a few generic “I love you cards” appropriate for Valentine’s Day, our anniversary, or just because he loves me. I bought some “I’m Sorry” cards, because he really freaking needs those. I got some blank cards. The Target bag was full of cards, and when I got home I handed them to him explaining that if he couldn’t even manage to open a drawer and sort through these cards I really would kill him. He wasn’t offended. My husband is aware of his shortcomings, but he was smart enough to have a card of his own waiting for me. A “thank you” card because he figured that was what he should have said on Mother’s Day, and because the grocery store was out of Mother’s Day cards. I may have to pick up a few more “thank you” cards for him. It was a nice sentiment. I feel your pain. Though I was “on vacation” in the mountains with my whole family that weekend, neither of my children wished me a Happy Mother’s Day. I warned my husband not to remind them and told him that he was off the hook because I am not his mother. I figure if they can’t figure it out on their own by the time they are 20, they may never. At least not until they get married and their wives take care of it for them!!! I absolutely hate Mother’s Day. And so does the creator of it (who was curiously unwed and childless). I’m with you Anna Jarvis! Let’s just get rid of that day, shall we? Oh boys! What were you thinking??? The hubs completely spaced on my birthday last year. I feel ya. Oh! That happened to me once too. Then he bought me a new grill to make up for it?!?! Gee whiz…I’m reminded of Fred Flintstone buying Wilma a bowling ball for her birthday….THANKS HUBS. I suppose you could buy him heels for HIS birthday though. I’m thinking a snow shovel…wait…that’s what I got for Christmas! All the better to provide percussive logic to his cranium…. GADS! My husband did forget my birthday last year. He finally felt adequately guilty that he bought flowers three weeks in a row for me. Although this did not FIX things, at least he felt bad for a bit! I do so understand! Loved how you solved the mess~ quite creative! These men…geez.